It’s not my IRA or retirement. It’s not my bank accounts. My relationship with God is the only thing of lasting value that I have. Everything else will be gone when I leave this earth. And that could be tomorrow. Or even later today. So am I putting the right priority on all this stuff that is so temporary? Am I spending my time and money on things that matter? God tells Ezekiel that he was the only inheritance the priests of Israel were going to have. The priests had no possessions and they ate from the offerings the Israelites brought to the temple. God wanted the priests to focus on him, not their earthly possessions. God wants the same for us. I learned an important lesson about this about 15 years ago when we downsized from a big 4-bedroom house with a pool to an apartment in order to join the Apartment Life Ministry. If you haven’t heard of them, look them up. Awesome ministry. But back to the move! So much stuff. We had lived in that house of 14 years while my children were growing up. The house was pretty empty right after we moved in but it was full when we started moving out. Whole rooms of furniture and ‘stuff’ needed to be sold or given away. I knew God was calling us into this ministry but I just didn’t know how I was going to get rid of all these material belongings. It was too much. Then God told me that the secret was to hold the material things of this world loosely. I remember walking through my house crying with my hands out, “letting loose” of all the things that surrounded me. After that, it became easy to pick out the things that needed to come with us and the rest went. It was a relief. It was refreshing. And when we got all moved into the apartment, we had everything we needed. Only the extra was gone. That experience changed my attitude toward earthly possessions. Less really is more. Less means less to clean and organize and store and maintain. 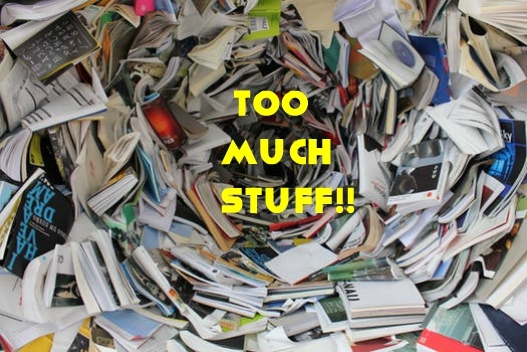 Having less “stuff” has given me more room and time for my relationship with God. Just like he planned. Thank you for the life-changing lessons you give us, Abba Father.